The wonderful thing about winter in Montreal is that the sky is clear and the sun is shining, but at the moment everything is wet and dark. We're in the post-Christmas-holiday slump and the weather knows it. Here at The Flower Pot we can't complain too much since our flowers help inject some sunshine into the dreary winter days we've had recently. This White Winter Nights arrangement we're promoting now does just that. 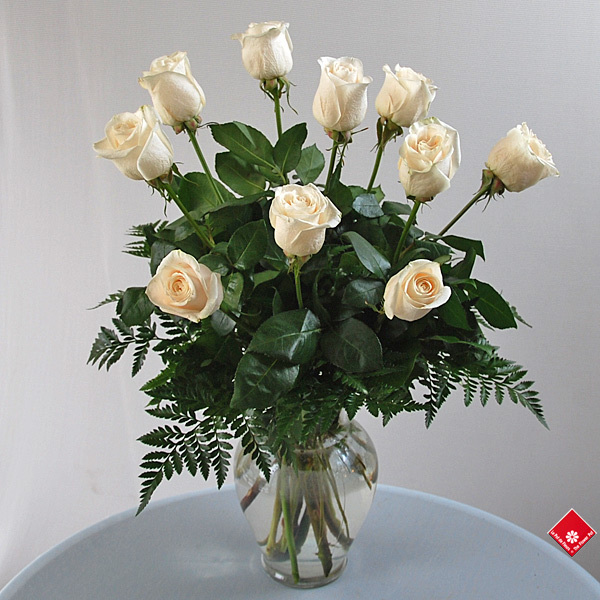 The ten frosty white roses are surrounded by green foliage that mirrors the deep greens of winter evergreen. It reminds us that even in winter, when everything seems bleak and grey, beauty blooms if you know where to look. That rule applies to holidays too! One of the warmest holidays of the year is set smack-dab in the middle of winter: Valentine's Day. Give the gift of warmth this winter season with The Flower Pot's Valentine's gift ideas. Don't see what you're looking for? We have even more options in our Griffintown shop. We'd love to meet you in person!